Spatial concepts and ways of expression made their entry in philosophy some time ago, partly inspired by, or in connection with, architectural ideas. On the one hand, they arrived via deconstructionism, emerging from the notion of Abbau – literally demolition – in thoughts voiced by Heidegger. On the other hand, via Deleuze’s ‘nomadic’ or ‘rhizomatic’ philosophy, in which the notion of spatiality is expressed in architecturally appealing terms such as ‘fold’, spaces that are ‘grooved’ or ‘smooth’, and ‘(de)territorialization’. In contrast to Foucault, Deleuze described his own work as spatially-oriented: it had to do with the outside, the unthought, the superficial, the fold, all that, in fact, remains strange or outside. 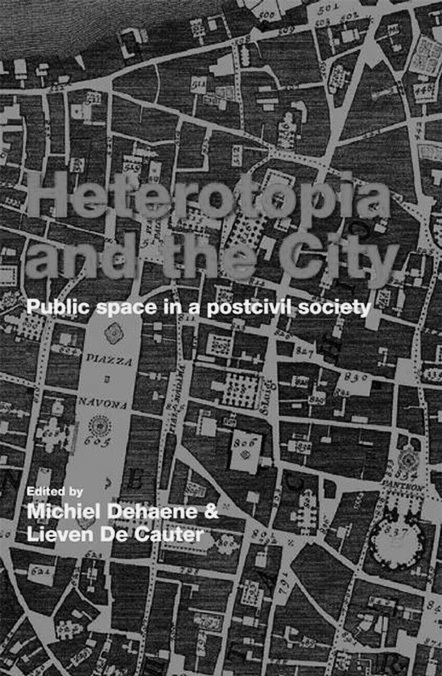 The collection of essays Heterotopia and the City: Public Space in a Postcivil Society, edited by the Flemish philosophical urbanists Lieven De Cauter and Michiel Dehaene, is now aimed at presenting Michel Foucault himself as a spatial thinker. Or rather, ‘re-present’, since the textual basis for this is already 40 years old. In the late 1960s, Foucault gave a lecture to a group of architects about ‘other spaces’, des espaces autres, which, despite – or perhaps precisely because of – their fragmentary and exploratory nature, began to form a source of inspiration for spatial thinking. The notion of heterotopia was central to this. Although only very tentatively indicated by Foucault, in the form of abstract principles that did not hang together clearly, the notion was meant to suggest something like ‘inversion, contestation or representation of actual places’; ‘external places’ that, although localizable, are ‘outside all places’ (page 17). It seems to me that, with the notion of heterotopia, Foucault’s intention was to translate his earlier analysis of the structuring effect of ‘discourses’ in terms of the structuring principles of places or living spaces, that is, ‘architecture’. Whereas discourses, in their mutual confrontation, worked in an ordering, exclusionary and regulatory way, it is now a question of a comparable ‘contest’ in spatial terms. The heterotopia is the real place that shows that reality is an illusion, or indeed the perfect place that is better ordered and more rational than normal space. In both cases we can speak, with Christine Boyer (pages 54 and 58), of a contestation with other spaces with the normal spatial order. Boyer’s skilful analysis shows how this can be applied, for example, to Foucault’s famous discussion of Velázquez’s Las Meninas. As Heidi Sohn instructively reveals in her contribution to the book, Foucault derived the notion of heterotopia from medicine, where it refers to ‘normal tissue in an abnormal place in the body’. In spatial thought and philosophy, therefore, the heterotopia is itself heterotopian! And the concept clearly behaves in such a way in this book as well. Following a short introduction by the editors, there is a (new, good) translation of Foucault’s original text, with two short accounts of the biographical and historical context of its creation; this is followed by 20 authors who each shine their light on a range of possible elaborations and interpretations of heterotopia, whereby it indeed becomes evident that both the concept itself and the practice it refers to are by their very nature nowhere really ‘settled’. Marco Cenzatti supplements Foucault’s quasi-historical distinction between ‘crisis heterotopias’ and ‘heterotopias of deviation’ – the first referring to special places in so-called primitive societies where temporarily disordered individuals can stay, the second to institutions where deviant individuals are placed – with a new period in which deviance itself has once again become a controversial concept. Such new heterotopias, which frequently form part of everyday life and are no longer necessarily and literally distinguishable spatially from it, acquire a normative charge, in the sense of ‘empowerment’ of minorities and resistance to dominant practices. The price paid for this is that the notion of heterotopia loses even more spatial definition. Other essays further fragment – ‘heterotype’ – the notion of heterotopia by continually undertaking other, new ‘tissue transplants’. De Cauter and Dehaene associate heterotopia with the ‘inter’ between public and private space, with play and the suspension of everyday economic life, and with ‘safe havens’ – ‘open’ spaces that still offer or enjoy protection in a post-sacral way. They even see heterotopia as a potential counterforce or strategy against the proliferation of ‘camp-like situations’, that is, extra-legal spaces. On the other hand, Setha Low’s otherwise critical and very readable essay also typifies the ‘gated community’ as a heterotopia. Both Low and Hugo Bartling emphasize the exploitation of gated communities as capitalist profit-machines, in which citizenship is contracted out to the project developer for an exorbitant service fee. Bartling’s essay deals with the Baudrillard-like project The Villages in Orlando, Florida, where one encounters official fake signboards with invented stories about non-existent (at least not existing there) cultural heritage, purely so as to create a nostalgic colonial atmosphere amid the raked over front gardens with streets through which the predominantly aged population prefer to travel in golf carts. Further kaleidoscopic offerings include David Adjaye’s Whitechapel Idea Store in Spitalfields Market in London, masculinity on Tel Aviv’s coast (Yael Allwell and Rachel Kallus), the embodiment of mobility in the Yokohama Port Terminal and, sure enough, the central station in Arnhem (Lee Stickells). Also discussed is heterotopia as a sort of negative projection of everything that project developers and municipalities nowadays want to build on wasteland, or so-called ‘dead zones’ (Gil Doron). In a well considered afterword, Hilde Heynen takes stock of the various contributions. Given the very diverse nature of the subjects and approaches, she can do little more than draw a few informative dividing lines and illuminate interesting contrasts. She does the same, in fact, as Foucault does in his seminal but porous text at the beginning of the book. Surprisingly enough, what is missing from this wide range of contributions is any consideration of heterotopia as virtual space – a topical notion par excellence that almost perfectly fits Foucault’s cryptic indications. Such an approach would also enable some of the quasi-paradoxes of spatial presence and absence to be better formulated. Moreover, it is strange that references are made in the essays to various previous publications of Foucault’s text rather than to the new translation at the front of the book. I could also imagine that the same editors could have used the same material to put together a fiery, anarchistic pamphlet on the political and social implications of heterotopia. The book at hand is indeed a ‘heterotopic reversal’ of this: imaginative, but above all learned, handsomely bound and richly illustrated. But this also means that the book is exceptionally expensive – more than 100 euros. It would be a pity if its distribution remained limited to traditional outlets because of this. Gijs van Oenen teaches in the Department of Philosophy of Erasmus University Rotterdam, where he directs a research programme on ‘Interactive Metal Fatigue’. He publishes widely on citizenship, the rule of law, illegality, safety and security, public space and democracy.